Greyhound advocates and animal lovers around the world turned their attention to Macau this week to once again decry the treatment of greyhounds at the Canidrome, after animal welfare organization Anima Macau challenged company representatives to a public debate over the merits of keeping the racing track open. The treatment of greyhounds on what international observers are calling “the world’s deadliest greyhound racetrack” is an issue that has drawn considerable attention from Europe. A group known as Stop Exportation of Greyhounds from Ireland to China is campaigning to prevent Irish greyhounds from being sent to the Canidrome. As many as 800 greyhounds are suspected to be housed there and more than 30 are killed each month. It recently emerged that exports of Irish greyhounds are beginning to fill the gap in the market created by the fact that Qantas and Cathay Pacific airlines decided not to freight the animals to Hong Kong. The reception from Europe has been overwhelmingly in favor of the Canidrome’s closure. An article from the Times uploaded yesterday to the website was flooded with comments from around the world, calling for “an end to this needless cruelty” and shaming the Canidrome for not agreeing to participate in the debate. Simultaneous protests were held in Dublin yesterday and outside the Embassy of Ireland in London, organized by the Campaign for the Abolition of Cruel Sports, while a second group, the Irish Council Against Blood Sports, conducted a separate lunchtime demonstration outside Ireland’s Department of Agriculture. Over the weekend, protests will be held in other European countries, including Italy and Germany. A petition hosted on www.change.org, calling for the closure of the complex, also picked up momentum this week and has now collected over 355,000 signatures as of last night. 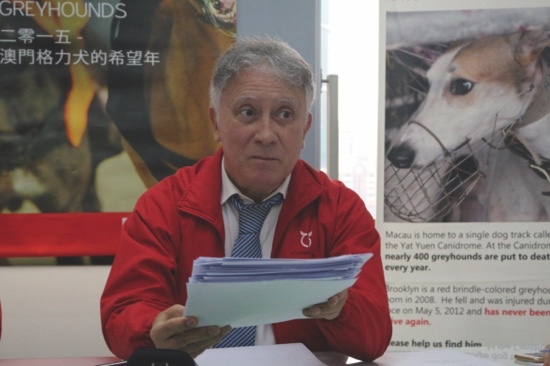 The petition, which is led by local Anima Macau President Albano Martins, will be presented to the Department of Agriculture in Dublin during an additional demonstration planned for June 2 in the Irish capital. Activists and columnists from Ireland’s media have denounced the silence from the government on the issue and the seeming unwillingness of the Department of Agriculture to intervene in recent weeks. Martins’s claim is that as Macau’s economy is largely dependent on tourism, the government pays a great deal of attention to how external visitors view the MSAR. He has therefore called for international condemnation of the Canidrome in hopes that it will pressure the MSAR government into not renewing the license of the facility – a decision on which is expected to be made later this year. “Our strategy with all the international organizations is to block [imports from] outside because the government does not block inside [domestic legislation],” he added at a press conference on Tuesday. Shameful, disgraceful, abhorrent and so wrong, on all levels. Profit should never be made through the misery of living creatures. Listen to the voice of the people, worldwide, we utterly condemn this shameful money making racket that is costing the lives of these graceful living, loyal dogs. Thank you for sharing the link…. This vile cruelty to these gentlest & sensitive of dogs is a national disgrace to China. The world is watching & waiting for them to do the right thing. We will not give up until there is no more racing & murder of these wonderful creatures. This vile cruelty, to these gentlest & most sensitive of dogs is a national disgrace to China. The world is watching & waiting for them to do the right thing. We will not give up until there is no more racing & murder of these wonderful creatures. Thanks for posting the link, since it was not in the article…..! If bribery and corruption are the reason the track’s lease was extended, what is the going rate to get it closed? How can the Macau Government justify subsidising this cruelty? Stop the subsidies – stop the cruelty! Please CLOSE the Canidrome in Macau the world’s deadliest greyhound racetrack. The first step in working toward this time of true humanity, humanity championed by thought, is to cease perpetuating cruelty such as racing noble, gentle greyhounds to death because it’s part of a thoughtless custom. I sincerely thank Macau Dailytimes for highlight racing greyhounds plight to their painfull death at Macau racing track. The world is watching what is going on here and thousands of people in Europe are protesting against this fact (I’m French). The exportation of nine Irish Greyhounds to Macau, where they will be raced to death at the Canidrome Stadium, has sparked a furious outcry from greyhound lovers across Europe. Stop Exportation of Greyhounds from Ireland to China was born out of this anger. In just two weeks, we have grown exponentially, yesterday holding a successful protest at the Embassy of Ireland in London, where we received enormous support from the public, and this Saturday promoting an International Day of Action across Europe. And we are just getting going! We have one short and simple message for the Canidrome: CLOSE! Stop this barbaric treatment of these gentle dogs, Stop the corruption and bribery. Please stop this cruelty. These dogs don’t deserve to suffer and die. A nation, and a people, are judged by how they treat the helpless. Let Macau show that it compassionate and responsive to the suffering these gentle creatures are forced to endure. Macau’s treatment of Greyhounds at the Canidrome Stadium Macau is a sickening display of greed, corruption and abuse of dogs on an industrial scale. China already has earned a reputation internationally for it’s cruel and merciless mistreatment of live animals. The world will applaud you Macau if you stand up against this and close the Canidrome! !! Thank you Macau Daily Times for highlighting this barbaric treatment of these gentle animals. How can the Macau government allow this to continue? The Canidrome needs to close now. How sad in a modern world we allow this terrible treatment to these amazing creatures. Shame on Irish breeders, the greyhound board, the Minister for Agriculture and the entire Irish Government for their involvement in allowing these gentle creatures go to a hell hole. This hell must be closed down and no more greyhounds sent to it to be treated in such a manner and die a horrendous death in a country so far away. Shame and shame on the people doing this and the people allowing it to happen. Thank you for this article. This facility has to shut down now! No living creature deserves this kind of barbaric treatment. Thank you for this article, Daily Times. Thank you for sharing that ordinary people from across the globe are working hard to see the wanton exploitation of and cruelty to these gentle greyhounds come to an end. Over a quarter of a million people have signed the petition to stop the export of Irish greyhounds to China. Thus, there exist over a quarter of a million people who could potentially boycott Macau in the future. The Canidrome has such a poor reputation that any person who cares in the slightest about animal welfare or basic decency will not set foot in Macau. Stop the exporting of greyhounds for racing. Close the Canidrome. Commercial greyhound racing is outdated, unethical, and certainly not sophisticated. Tracks are closing across the UK. Greyhound racing is diminishing in the US where it is legal and operational in only 6 of its 50 states. Get with the times, Macau. Thank you to the Macau Daily Times for promoting this story, such appalling acts of cruelty please help us close the Canidrome down for good ! Greyhound racing is cruel in any country. But in a country without animal welfare rules, it’s a veritable death sentence. This is not the image of a modern, civilised society that the majority of the world’s citizens want to see. Shut it down now! Thanks for highlighting this welfare issue. In response to claims that there is reliance on tourism and that racing is part of this, it’s about time the world adapted and found more sophisticated ways of providing entertainment. Think of the money that could be pumped into futuristic fun that didn’t involve animals at all. Well, Macau, are you going to innovate and show the world something new or just keep pushing out archaic ‘sports’ that involve death to living creatures? I urge you to adapt, innovate and surprise, become a leading light in new tourism and change this barbaric practice. Just see each animal as if it were your child, mother, father, sister or brother or any other being you love and apply the same treatment to the animal as you would to those you love. Could you see them beaten or tortured, killed or eaten? No? So how can you stand by while defenceless animals endure such treatment? Thank you to the Macau Daily Times for highlighting the racing of greyhounds to their death. It’s heartbreaking to see the barbaric treatment of these beautiful, gentle animals. The Canidrome really needs to be closed down. You ask us for polite comments be that as it may I hope you understand that being polite to you about the Macau canidrome and the way you mistreat and murder greyhounds there is extremely difficult. However I thus politely ask you to stop importing greyhounds from Ireland I also politely ask you to ban racing at the canidrome and let families adopt the greyhounds as pets not bets and not food. It is high time you ban racing in China ,you are already in a financial mess why do you continue to mistreat and murder greyhounds in China injecting them with pesticides so that they die an absolutely agonising death in absolute fear what kind of sadistic entities are you no one in their right mind would ever do this to these noble loving sighthounds they deserve to live all of them. We know three of the Irish greyhounds by name and by their looks namely the two brindle siblings Crossfield Simon and Crossfield Leona and the black and white male known as Two Stone Tadgh and the Australian greyhound known as Brooklyn. We name them and follow them in order to keep them alive albeit not safe please release all four of these named greyhounds for adoption these are enough people world wide who will gladly give them a good forever home.Thanks for reading this mail.Don´t import any more Irish greyhounds stop murdering the greyhounds at the canidrome ban racing through out China yes most of us are aware of what you are doing not just at the canidrome but also at the Shang Hai zoo stop it just stop it. Please stop abusing and killing our greyhounds. They are gentle and do not deserve this treatment. The world is watching and aware of the cruelty suffered by greyhounds at the Canidrome in Macau. It is infamously known as the worst place for a dog to be abused by the racing industry and end its life. These gentle sentient beings deserve better. Here is an opportunity for Macau to show the world it can make the moral decision to close this race track and end this form of animal cruelty. Close the Canidrome. In the 21st century there is no support for greyhound racing. The dogs are treated appallingly. I have boycotted all things Chinese in support of these beautiful gentle creatures who deserve fair treatment and kindness, NOT cruelty and exploitation. Please please close the dreadful place – whether for Irish, Australian or any other greyhounds racing to their death. These creatures are gentle, sensitive, lovely and make the very best companions. Not one single one of them deserves this terrible fate. Bet on something else if you want to bet – something that doesn’t involve the abuse and neglect of any animal. As we fight for human rights, we should take responsibility for animal rights. It is within our control. There can be no jusification for making profit from slavery. The welfare of these dogs lies with all of us. It has to stop. We will be protesting in Venice next saturday against Macau canidrome, hopefully we will have the chance to let tourists from all over the world to know what happens in this hell hole. Please, please, stop this cruelty! Macau, you have many impressive casinos for those who like gambling, great heritage spots to explore, and good food – you really don’t need this terrible barbaric practice to be highlighted to the world, you don’t need to torture, maim and kill innocent beautiful Greyhounds for the sake of entertainment and infamy. Why would you want to profit from practices that create inauspicious fengshui linked to cruelty, oppression and certain death? There is so much more ‘light’ and good vibes to be found in Macau. Please, Macau, close the Canidrome! Please end this hideous abuse and close the track. Greyhounds are such lovely dogs and if you knew how sensitive and loving they are, you would be ashamed. So so awful that beautiful greyhounds are put through this ongoing misery & our hearts are broken over & over watching it happen. It will be a great day when the Canidrome is closed down & Macau will earn international respect as a society which cares about animals. Thankyou. Please end greyhound racing at the Canidrome in Macau which is the world’s most hellish race track. The dogs stand no chance of survival and while they live there they are subjected to the most miserable living conditions. When they are killed it can be in the most inhumane ways. There is nothing to be proud of when all you are doing is exploiting dogs for a seedy gambling industry. Thank you for highlighting the greyhounds’ plight. There is no place in the world for such a place as the Canidrome! Macau will gain the respect of the millions of dog lovers throughout the world when they shut it down. Please stop cruelty to beautiful greyhounds! Very simple – this has to stop NOW!!! please please please !!! close down live dog racing here ,computerized dog racing will give the same result and no live dog ever gets hurt. The Canidrome Stadium is Macau’s shame! Close it and end the cruelty – save these beautiful dogs! I found a beautiful stray abandoned greyhound today in our local forest. Absolutely beautiful dog left to die because he didn’t win the race I presume! It happens all the time. People can be so cruel and heartless. Terrible act of cruelty! I couldn’t just walk by and leave him in such an isolated place. He has a new home now and he is happy. Greyhound racing should be banned! People who mistreat these magnificent dogs should be made race around the circuit on all fours themselves and see how they like it and win or not, should then be abandoned in a remote forest with no food, period! Blessings to you for rescuing this dog. As you can verify from your Live Traffic Feed, the world really is watching you Macau,please close the cruel Canidrome now,it is the shame of your country. Thank you Macau Daily Times to highlight Greyhounds plight at Macau race track ! This hell has to be closed ! It’s not fair to kill 30 Greyhounds each month. Please stop racing greyhounds at Macau,, close the stadium down, close them all down all over the world,. these dogs are the most docile,. beautifully tempered,, gentle souls. i have owned two ex racing greyhounds and they are the most wonderful companions, they were bred for Kings and Queens not for these barbaric practice,. Please Macau, close this Stadium now. No animal deserves this torture and death. Macau the rest of the world is judging you on this……I’m sure there are postie, beautiful place in Macau but this is not what the world sees, is it really worth keeping the stadium open at the cost of the rest of the city as Macau is associated with Death and cruelty by the rest of the world. Please end the export of greyhounds to the Canidrome. We know that they have a very short life there and die a very cruel and vile death. Please make the right decision Macau for the sake of your reputation and close this track of death. Thank you Macau Times for publishing the truth about your only greyhound track. Greyhounds kept in the Canidrome will never leave, they are destroyed at an alarming rate with a lethal injection of pesticides. Greyhounds NEVER leave the stadium, greyhounds NEVER come out alive. They deserve a right to have normal life’s and with people who cherish them. Close the Canidrome -Canidrome Stadium is Macau’s shame – save these beautiful dogs! Do the right thing, preserve tourism, end the shame of the Canidrome. Please close the Canindrome. These dogs do not deserve to live short miserable lives. Just close it NOW; preserve life don’t exploit and ruin life to make money. Shame! Thankyou for highlighting the plight of the beautiful greyhounds. This racing track (along with all others) must be shut down. There is no excuse for this appalling abuse of dogs. Shut down Macau racetrack TODAY!! NO MORE CRUELTY TO THESE POOR GREYHOUNDS. U SELFISH GREEDY HUMAN BEINGS. Please close the Canidrome, these beautiful dogs deserve better than this, people all over the world are against this awful place and it would do so much good for Macau’s reputation if the Canidrome was closed and the dogs all revoked. Close the Canindrome now. Stop the abuse and death of greyhounds. Thank you for publishing articles on the Canidrome. This horrific spectacle has to stop. Dogs selected for the Canidrome receive a death sentence. There are protests taking place all over the world today to stop the exportation of greyhounds to the canidrome. This is a fact. Do the right thing and close this Hell Hole as it’s now being called. Have some dignity and some respect and pride as a nation and stop this barbaric act of untold cruelty. Animau Macau have being trying for years and now have the support of the world. We are still watching and will not go away until the day it closes. Kinds regards. Macau’s shame is shared by all the heartless participants in this inhumane and barbaric industry. #shutitdown. The cruelty in the greyhound industry extends further than just the dog, see this 6 minute YouTube video on the cruelty in the Australian Greyhound racing industry.